When comedians Bruce Williams and Terry Ree first came on the scene, political correctness wasn’t a “thing,” but ranting politics was definitely their thing. They didn’t necessarily take sides — they took aim at everybody. If individuals were in the public eye and they were caught doing something stupid, their actions were fair game. Williams & Ree not only made fun of these people and earned laughs at their expense, they might even have written one of their saucy little ditties about the situation — and their audiences would be laughing their butts off. Despite their longevity in the business, things haven’t changed. They still love to skewer anyone who ruffles feathers, because politicians still walk among us and they’re still prone to making dumb mistakes. Then again, the duo might just take their personal agenda in a totally different direction. That issue might be something as frivolous as the lack of Hostess Twinkies and Cupcakes. Hey, if you’ve been on the road as much as “The Indian and the White Guy” and have grown to expect these “important” comfort foods to be available no matter what little hole-in-the-wall gas station you fill up at, you might be compelled to take action too. And that’s what they did a few years ago, writing a song about their plight — “The Ding Dong Song” — even filming an accompanying video as their exclamation point (check out their website, WilliamsAndRee.com to see it). Of course, like the cream-filling of the Ding Dong center, this cute little song’s center is filled with secret ingredients, double entendre and humorous innuendo. And, just like anything Williams and Ree do, the song is ridiculous, sublime and funny. Williams & Ree have that innate ability to see the humor in everything around them. And that’s a good thing to possess when you have enjoyed a run as long as this comedy team has. This long-running duo doesn’t follow guidelines or conformity, spinning comedy gold from the union of a Plains Indian (Ree) and a “Western Angloid” (Williams). To these guys, nothing is off limits. Originating out of the Dakotas, this music and comedy team has been together since the late 1960s. They first met at Black Hills State University in Spearfish, South Dakota, as members of a band who filled time between songs with comedy sketches. Their humor soon became more popular than their music. Much of the duo’s banter plays upon the stereotypes held of Native Americans. The comedic pair has earned a CMA vocal duo nomination and their television credits include “Country Kitchen,” “HeeHaw,” Laff TV and Comedy Central. 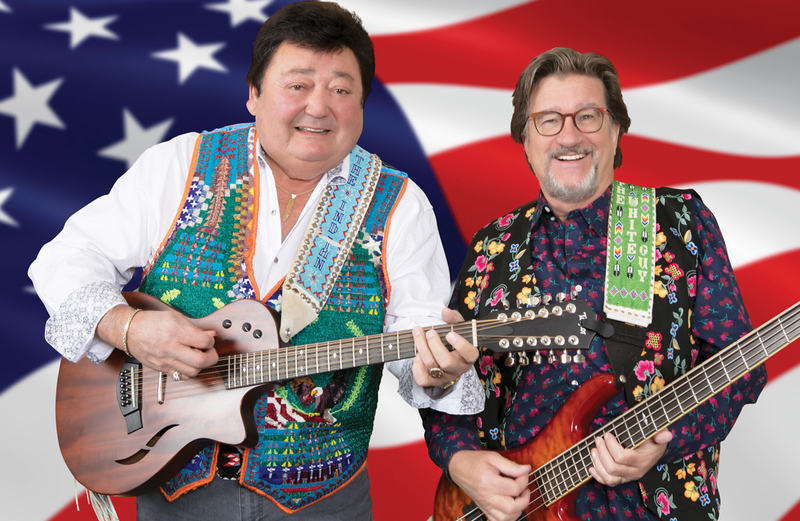 They currently host country music festivals around North America and are featured on Sirius Radio and their own irreverent podcast, “The Red, White, and Slightly Blue Show.” Williams & Ree regularly headline shows at fairs, theaters, casinos, and small, out-of-the-way dives. Their message is one of love, harmony, commonality, deceit, debauchery, the ridiculous and the silly, delivered with music and song parodies. They remain one of the few comedy teams still working today and the only one that performs at the Avi Resort & Casino on a regular basis. How’s the world in “sou’dakoda” this morning? It’s cold … below zero, that’s cold even for them. This is the Black Hills you know and they’re supposed to have Chinook winds and all that stuff here. I’m going to have to get a Pendleton blanket and warm up and make sure I don’t catch a cold before the show. Is Terry still as politically incorrect as always? Yes, he’s still a Trumper… he is and that’s just wrong. But we don’t “heavy-hand” it so much any more because, first of all, it divides your audience when you do that, unless you’ve got a good thing to say or a good joke to use that’s foolproof. That Donald Trump has been a fountain of material, for sure. When Obama was in there it wasn’t that funny, but Trump has just been so off the charts. All the comedians that were struggling before, now are getting the highest ratings. You and the Indian are on opposite sides of the coin in those political arenas? Absolutely, he’s a lifelong Democrat, and then Trump came along and he voted for Trump and he’s been stumping for Trump the whole way. Not me. (He laughs). What are your thoughts about returning to the Opry? Talk a little about your creative process. We’ve just been able to kind of work like we do on stage, when we’re just driving around and stuff. Sometimes we come up with the funniest stuff that way, it’s just our natural gift of gab. Of course, the Indian is always opinionated. My job is to interrupt his flow. We have a new CD and we have a new DVD. The new CD is called “High Falutin’” and it’s a dozen songs that I wrote or co-wrote with some friends of mine in Nashville. Terry sings on a couple, but mostly it’s me, yeah. The DVD is us live at Copenhagen Hall at the Norsk Hostfest in Minot, North Dakota. It’s a Scandinavian Festival we’ve been going to every year for, gosh, 25-30 years. They love that Indian up there. They think Charley Pride is Norwegian. We should have a few new gems, but lately we’ve been going back to some of our older bits, dusting them off and bringing them out, yeah, ’cause we realize people want to see them. They have this act in Nashville called “The Doyle and Debbie Show,” that we go to. They’re only on Tuesday nights at the Station Inn, in Nashville and it’s a play with original music and the two stars are Doyle and Debbie. Doyle is this old washed-up country singer who’s written these bawdy country songs that would never get played on the radio, but he nonetheless is clinging to these autobiographical songs that he writes and they’re hilarious. He’s working on his third Debbie, because the other two have flamed out. The new Debbie’s got a couple of kids waiting out in the car while they’re doing the show. She’s got a little baby monitor out in the car and she talks to the kids and they’re always fighting. He laughs, and it’s just a hilarious show and it’s like Spinal Tap or the Grand Ole Opry on acid, you know — you go and you see the same show, but you see a little something different because you weren’t paying attention or you got distracted, and you keep going back and seeing the same show over and over ’cause it’s so brilliantly crafted. We also just returned to some of our old bits and it’s because we know people want to see ’em — if they can remember them. The ones that don’t remember them, it’s a new bit. When it comes to jokes, we never throw anything away … it’s called recycling, repurposing. Your fans are still out there in droves and they still love what you do. We are doing the Country Thunder Music Festivals throughout the year There were three of them, but now we’re on five. There’s one in Florence, Arizona; there’s one in Craven Saskatchewan, Canada; one in Calgary, Alberta, Canada, Twin Lakes, Wisconsin is the other one; and the new one is in Kissimmee, Florida. It’s cool that people still show up for our shows. It’s fortunate that it continues to be that way even into our golden years. We’re experiencing that nice little rush. We’re blessed that the snowbirds from the Midwest go to Arizona, New Mexico and Nevada. And it keeps the rumors of our demise at bay. You know, the “are they still alive?” question. I think we’ve got another life now because there’s a niche left over from the Smothers Brothers’ retirement — and those are some big shoes to fill. We’re filling their shoes with Sioux love. We don’t have any backstage fights anymore — at least, none that I know of. We were in Elko, Nevada, once and we saw these Ukranian comedians, the Mathis Brothers, come off the stage and duke it out in the dressing room. We wondered, “is this what we have to do to be comedians — we need violence to pick things up?” We’d never seen anything like that. They would beat each other bloody and come out and do their thing. The Sioux guy is a mellow character compared to that …until he’s pissed and then there may be a small fire — but it only burns out the white people.